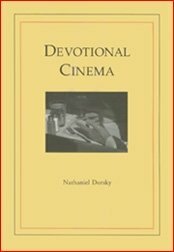 In this perspicacious text, Nathaniel Dorsky discusses the conjunction of religion and film from the vantage of a devotee. The crux of his discussion is a nuanced understanding of "devotion" not as an experience specific to religion but rather as "the opening or the interruption that allows us to experience what is hidden and accept with our hearts our given situation." Moving through meditations on image-moments in works by key filmmakers (Carl Theodor Dreyer, Yasujiro Ozu, Michelangelo Antonioni, and Roberto Rossellini), Dorsky arrives at the heart of what constitutes a devotional practice. It is metaphysical and technical; this lovely little masterpiece is about the medium of experience, the projection of devotion, the making of art. Long a figure of interest to many contemporary American poets, Nathaniel Dorsky has been making and exhibiting avant-garde films since 1964. He now lives in San Francisco where he makes a living as a film editor. His works have been shown internationally and are in the permanent collections of the Museum of Modern Art (New York), the Pacific Film Archive (Berkeley), Image Forum (Tokyo), Les Archives du film expérimental d'Avignon, and Le Centre Pompidou (Paris) as well as many universities. Among his better known works are Summerwind (1965), Hours for Jerome (1966-70, 82), Pneuma, Alaya (1976-87), Variations (1992-98), Arbor Vitae (2000) and The Visitation (2002).